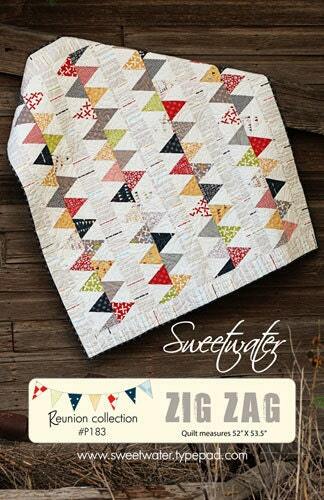 I bought the Sweetwater's Zig Zag quilt pattern quite a while ago. Since then I've shopped and shopped for fabrics to make this quilt and nothing ever seemed right. 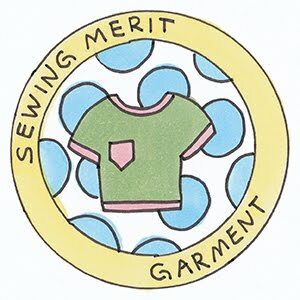 After weeks of searching for fabric, I realized my procrastination was because the fabrics that were used on the pattern were the fabrics I really wanted for my quilt. Sweetwater's Reunion collection is beautiful. It is also much different from the pastels I usually use. Amazingly, it didn't take me long to put this together. I thought the triangles would mean trouble, but they were pretty easy to cut. Over the course of the weekend, I ended up with a completed quilt top. 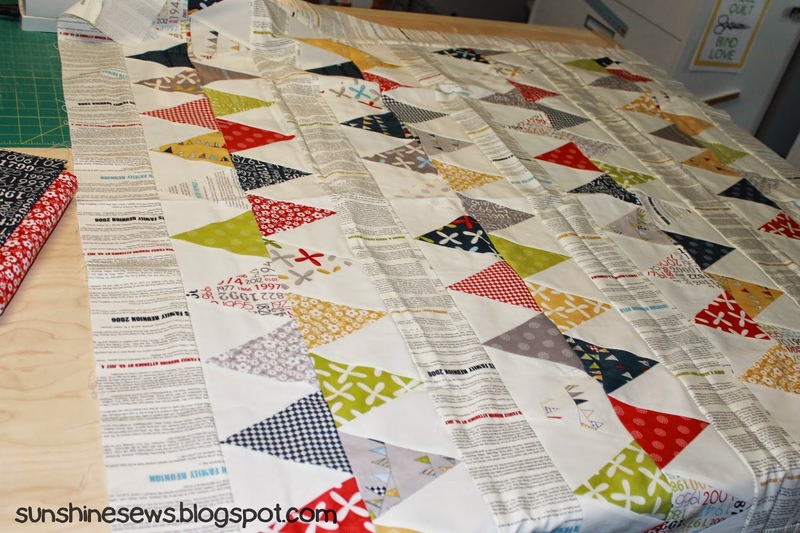 A while back I made the quilt top, Pick-It Fences from an issue of Quilts N More magazine. It used up many scraps from my stash (26 different prints to be exact). I was lucky enough to have also used some strips from larger chunks of fabrics, not just scraps. Some selvedges revealed that a few of the fabrics were manufactured as far back as 1986! I sure hold on to things for a long time. I decided to cut 8 x 8-inch blocks from the leftovers and let them sit until I figured out what to do next. Since the quilt top has lots and lots of white in it, I really wanted a lot of color in the quilt back. I incorporated white strips in-between the squares until I ended up with 5 rows of 7 squares. That used up most of the bigger chunks of fabrics. I still had a ways to go to have a piece big enough to back the quilt. I cut strips from the rest of the prints the same width as the white strips for a consistent look. Since the strips were all different lengths, I sewed white on each end so that the print was exactly in the center of the row. I ended up with 10 rows so I sewed 5 on each end of the patched piece. So now I have a quilt back! I cannot wait to quilt it and sew the binding on. We have a new quilt shop in our area called Coins and Quilts. 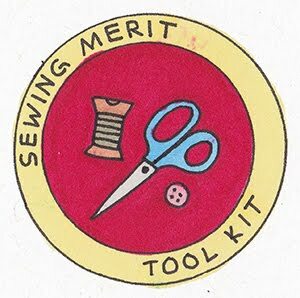 One of the ladies in my church quilting group recommended this shop to me since I was looking for a quilter with a long-arm machine to finish one of my quilts. I looked up their hours which weren't very convenient for me (10 am to 5 pm, Monday through Friday). Since I work until 4 pm and the shop is more than half an hour away, I know it will be difficult to get there. And that's the last thing I want is a time crunch when in a quilt shop! So my first visit was on one of my afternoons off. The shop is on Highway 100 in Greenfield, which is very busy and currently under construction making it more difficult to get to. (I hate driving on a good day.) When I got inside I was greeted by the friendliest couple ever. 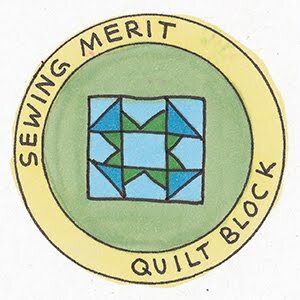 The shop is called Coins & Quilts because the husband is a qualified numismatic (coin appraiser for us who aren't in the business) and the wife is a long-arm quilter. Thus a marriage of hobbies was born. The shop sells a wide variety of high-quality fabrics, patterns, notions and of course, quilting services. The shop wasn't very cute or fancy, but it was new and I am sure in time, it will get prettier as more quilt samples get added to the bare walls. As a novice to the use of a longarmer, I was treated with patience and respect as I learned the process that my quilt top and backing was going to go through to get the end result. 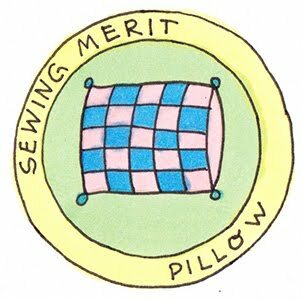 After spending lots and lots of time choosing a quilt design and thread colors, the estimate for the work was written up. Surprisingly, it was very reasonable to me. So I left my Synchronized Squares quilt and backing in her care and look forward to seeing the results in a few weeks. Here are the first four blocks for the Sampler Quilt Along. Each block has a cute summery name. One more, and I am all caught up! 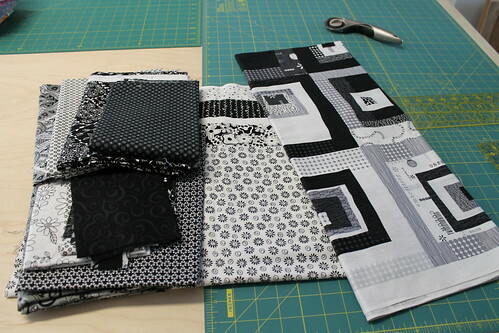 Michelle over at Quilting Gallery is doing a beginner's quilt along where you make a sampler. Each week a square is revealed so it's a mystery as to what will come next. 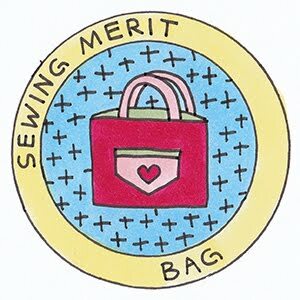 I stumbled on it during week 4 of the quilt along and even though I think I am slightly past the beginner stage, I really like the idea of making a sampler. I could use up my black, white and gray collection and put the finished quilt on my sewing room wall or use it on my day bed. Make sense to have a sampler hanging around a sewing room, I think. So I gathered up my stack of blacks and whites and started making the squares. This is going to be fun. Sampler Quilt Along, a photo by SunshineSews on Flickr.